Sounds strange, doesn’t it… but it’s the truth. We want to be your partner in your child’s education. We want to help you teach your child the skills they need to be more independent, productive and successful with their goals. Why is this so important? Simple, we want to change the world. We believe that each one of us plays an important part in our local, national and global society. We believe that each one of us (regardless of ability level) has a purpose and that by reaching our goals, we can inspire and transform the people around us. Our children are the most precious and dear things that we have been entrusted with. It is important that we provide them with the best opportunity to succeed at whatever they choose to do in life. 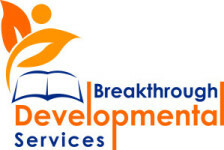 At Breakthrough Developmental Services, we do that by teaching our clients and their families a variety of skills necessary to be successful in an assortment of areas. If you need anything, feel free to email us at Info@BDSHelps.com, give us a call at 855-255-5270. You can also click here to fill out our contact form. Feel free to pass on our information to someone who you feel that we may be able to help.